Bonn, 11 September 2015- BirdLife International hosted a meeting yesterday with senior CMS staff. 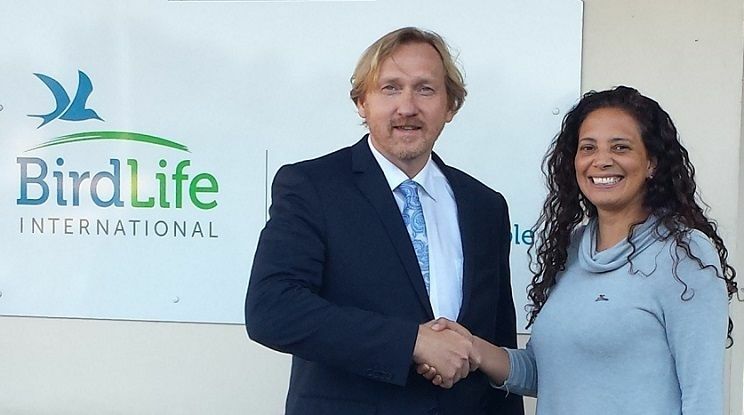 Meeting for the first time, CMS Executive Secretary, Bradnee Chambers, and the newly appointed BirdLife Chief Executive, Patricia Zurita, agreed to strengthen cooperation between the two organizations. Some of the priority issues discussed included the crisis that is currently affecting vulture populations in Africa and how it can be tackled through a multi-species action plan. Also on the agenda were: the illegal killing of birds in the Mediterranean and the recently created CMS Task Force; the conservation of landbirds in the African-Eurasian region and the impact of land use change on natural habitats; the conservation of flyways in the Americas and the promotion of the Americas Flyways Framework. Bird poisoning was also discussed, in particular, the possible appointment of an interim coordinator for the working group on preventing poisoning. CMS and BirdLife agreed to review their existing Memorandum of Cooperation and to focus on some key and strategic issues, with a strong emphasis in communication and awareness raising and to work together to raise the profile of the World Migratory Bird Day campaign.